We spent the night in an RV park that was the epitome of Jed-designed, Jed-implemented RV splendor. The incredible details were far too numerous to mention but suffice it to say that we will not be staying there again by choice. We were, however, able to get our clothes laundered without anybody stealing our stuff. 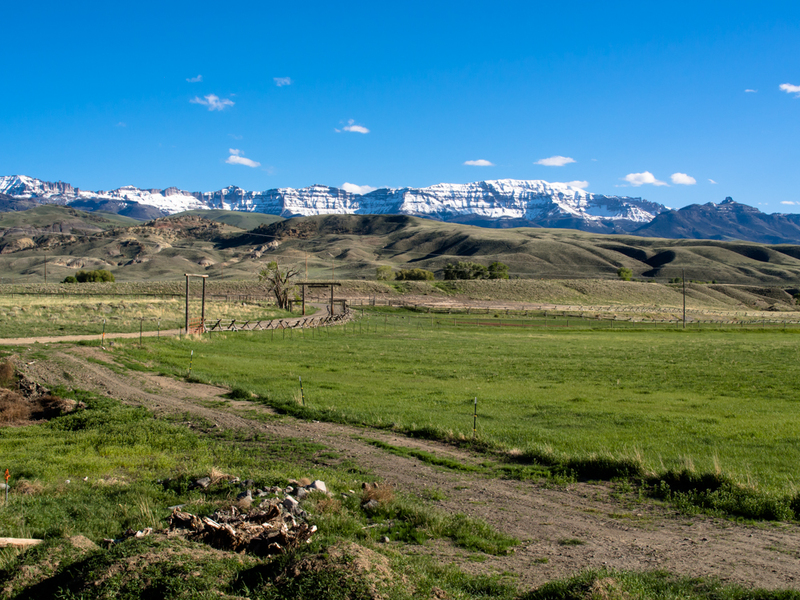 Next morning, we broke camp and headed to Cody, WY to join one of our unimog friends at his ranch. The RV park had its own hot springs. Back in 1913 they drilled for oil here, but only hit hot water. But, the borehole left a 1.3 million gallon/day spring. The structure above resulted from the deposition of dissolved minerals after the water exited the borehole. 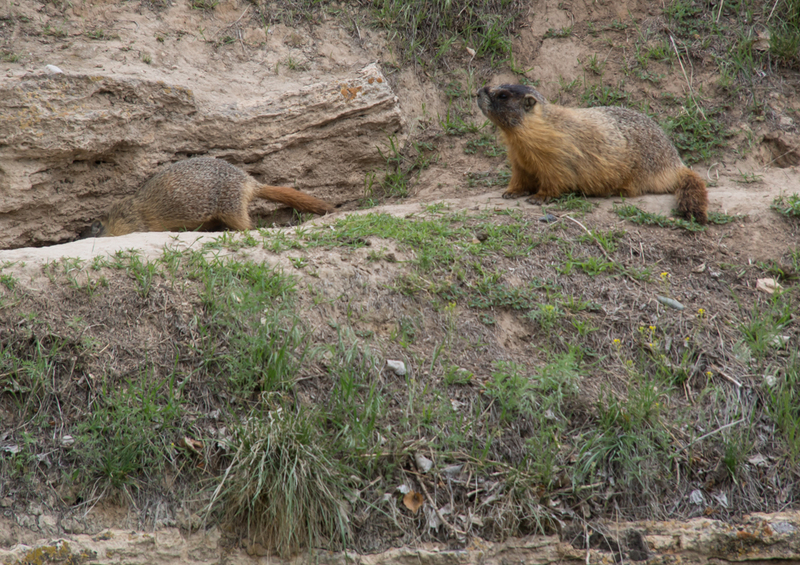 Next to the springs were a family of rock chucks dug into the canyon walls. 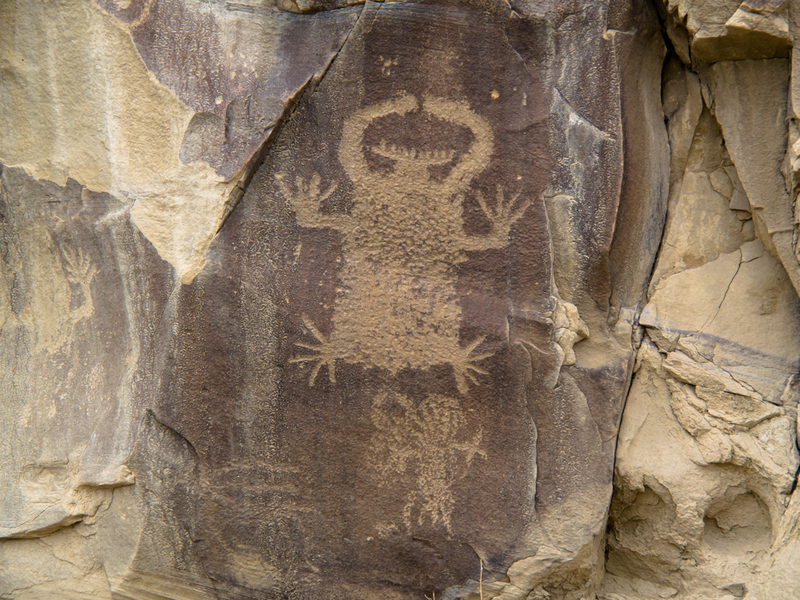 North of Thermopolis, we took a detour to the Hamilton Dome area to see some petroglyphs. The dome has had active oil production since the early 1900s and they, too, had hit hot water on their way to the oil. But, in this case, they just kept on drilling and discovered that the oil was below the hot water. 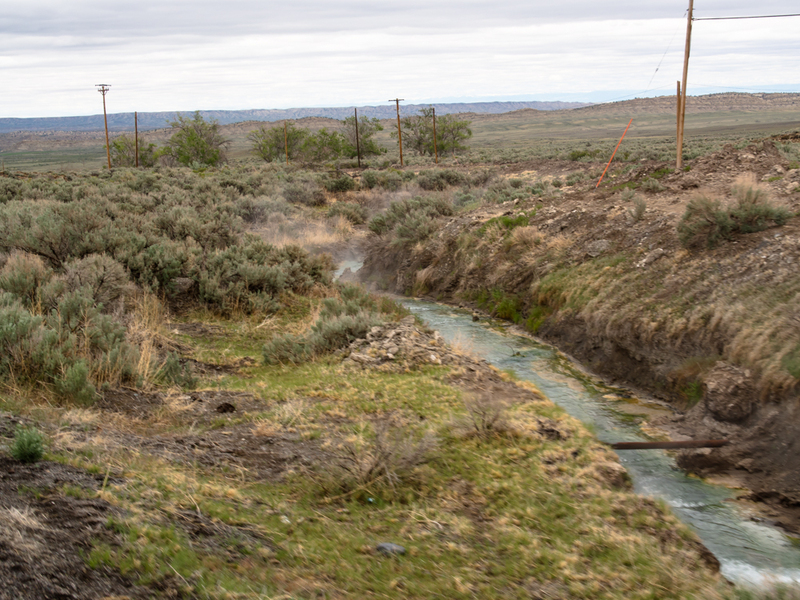 Above, you can see the steam rising from runoff water from the wells. 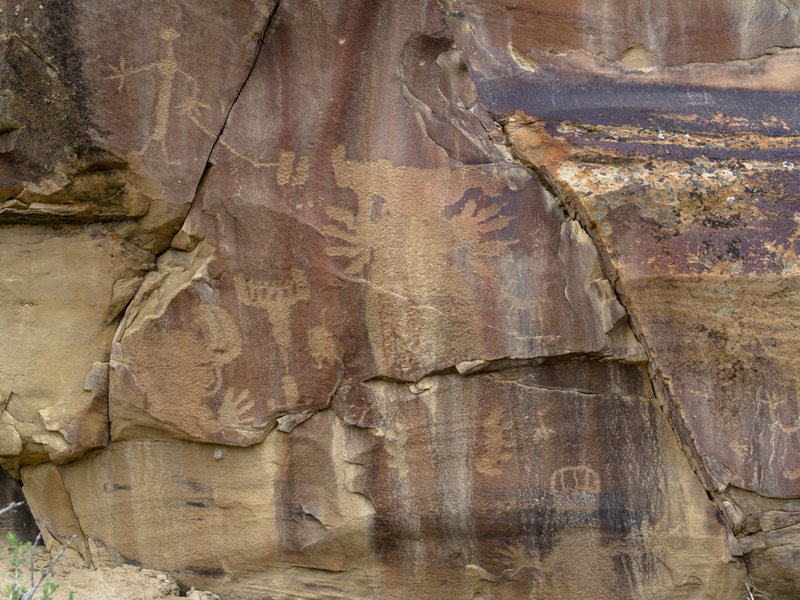 We found the petroglyphs with the assistance of some oil field workers. 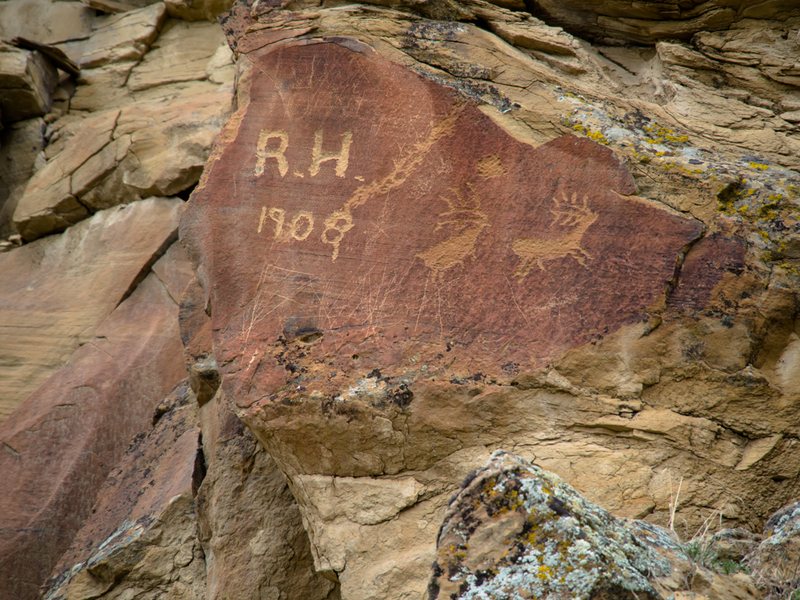 The carvings were on an escarpment near a creek to the north side of Hamilton Dome. 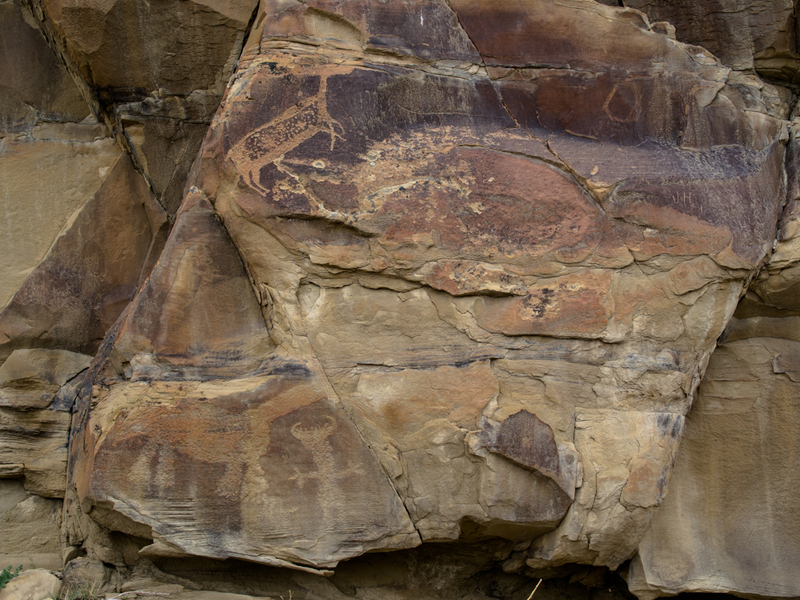 Some of the carvings were estimated to be between 8,000 and 11,000 years old. 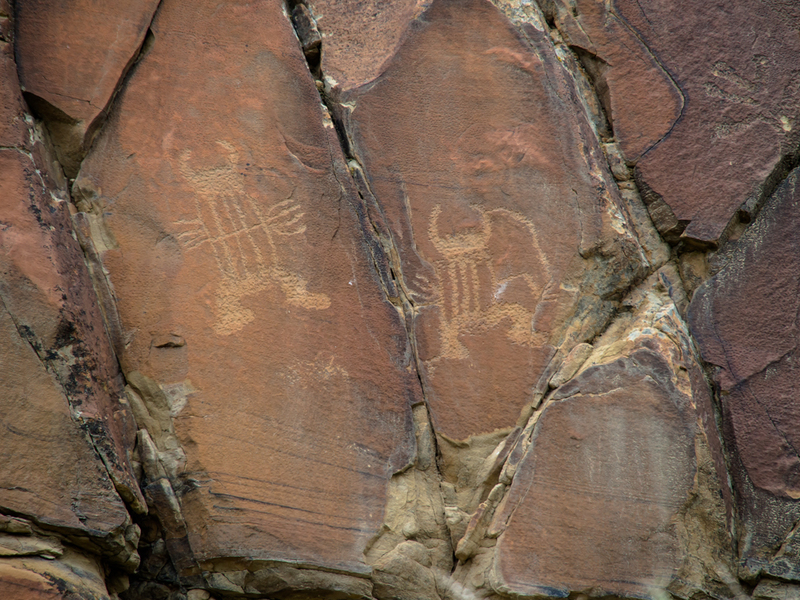 The carvings consisted of the usual collection of glyphs. 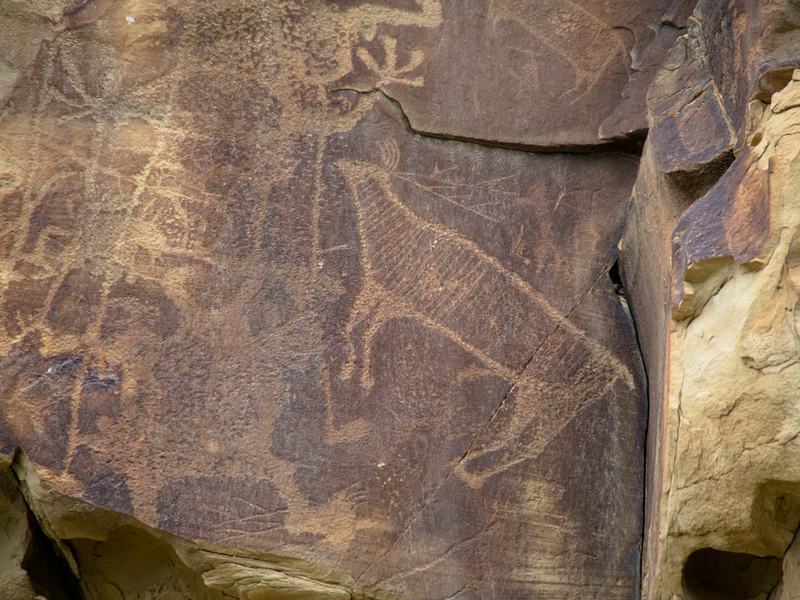 This rabbit depiction was deeply pecked into the desert patina in the rock. 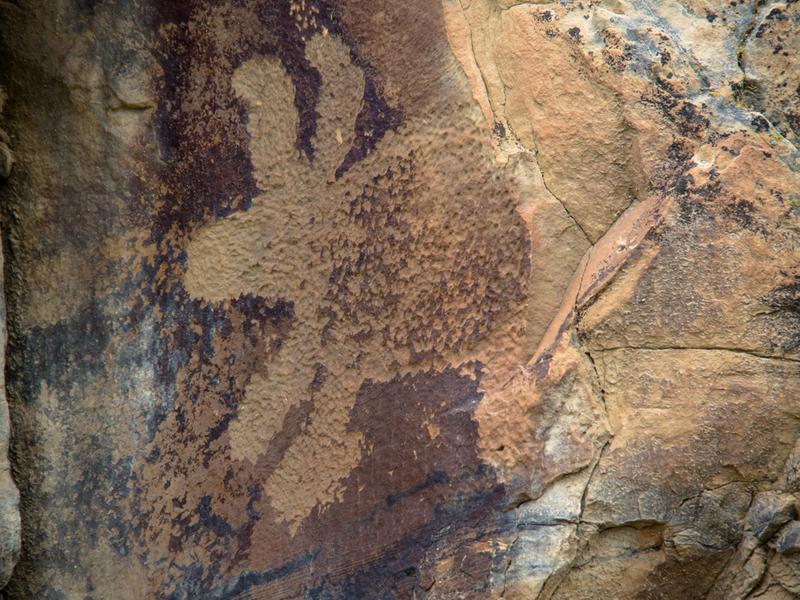 A portion of the cliff face has spalled off removing part of one of the glyphs. 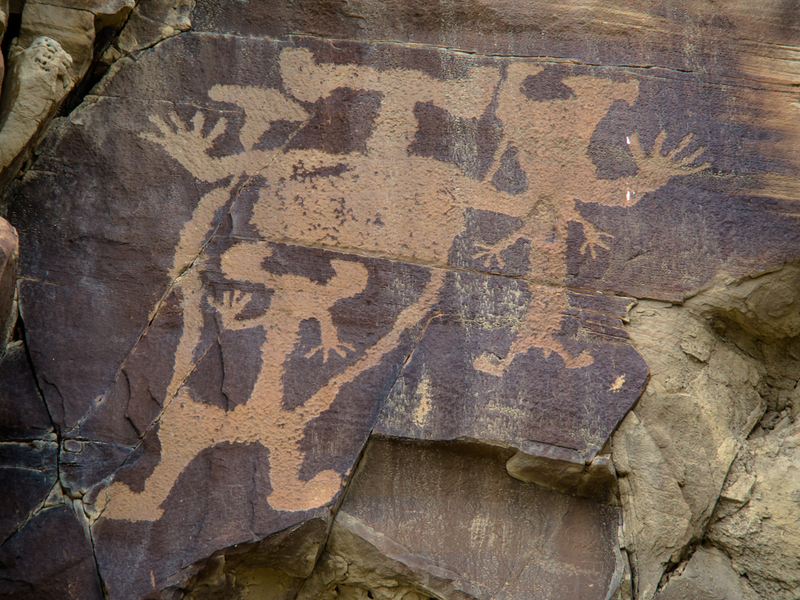 These glyphs were anthropomorphic, if a bit optimistic. The thunderbird glyph is novel. 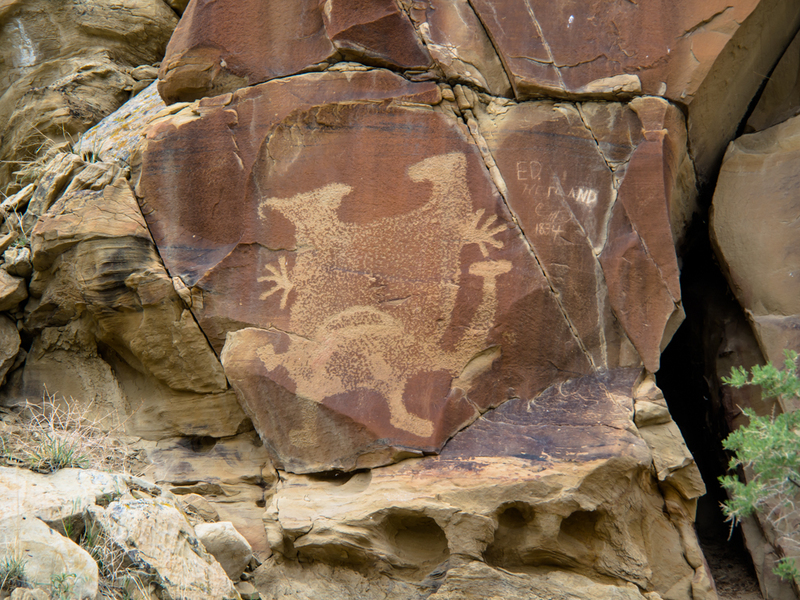 An interesting glyph, but I am not sure what it depicts. 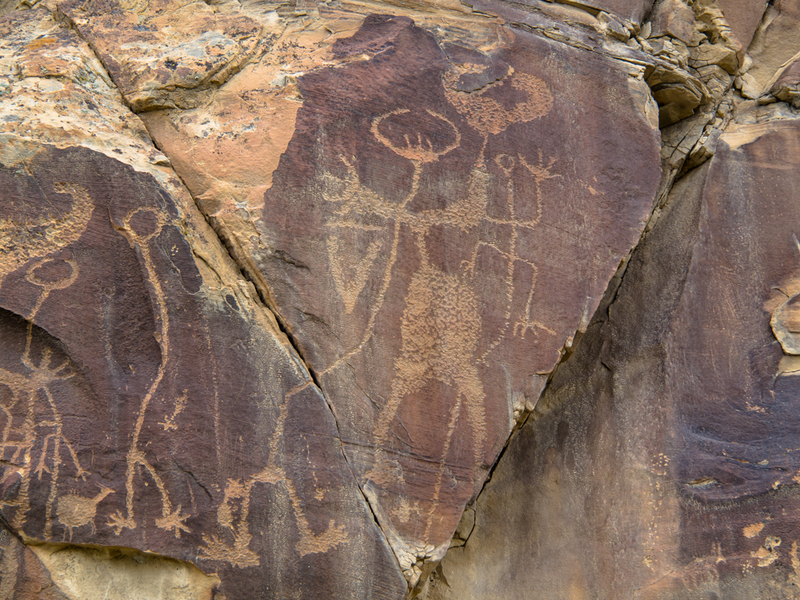 Some of the glyphs were sufficiently abstract to prevent positive identification of the object. 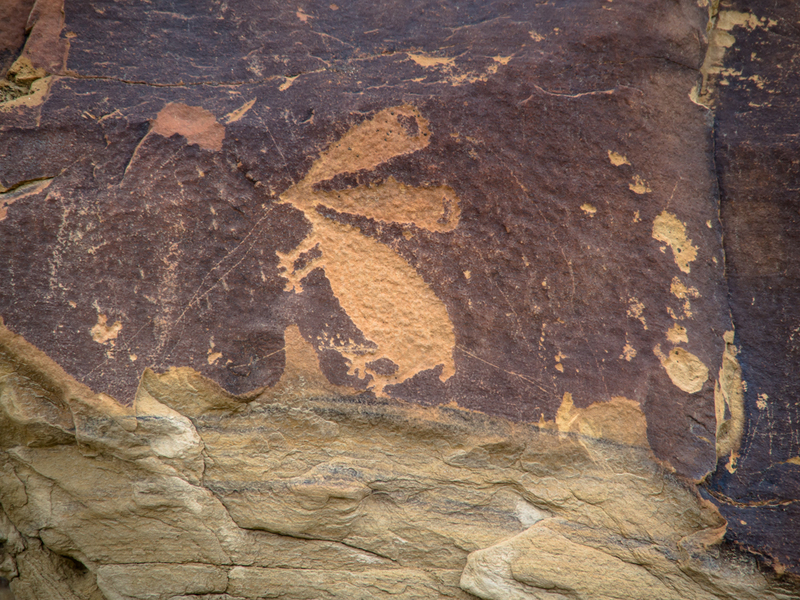 This rabbit was deeply pecked and due to the weathering was clearly much older than some of the other glyphs. 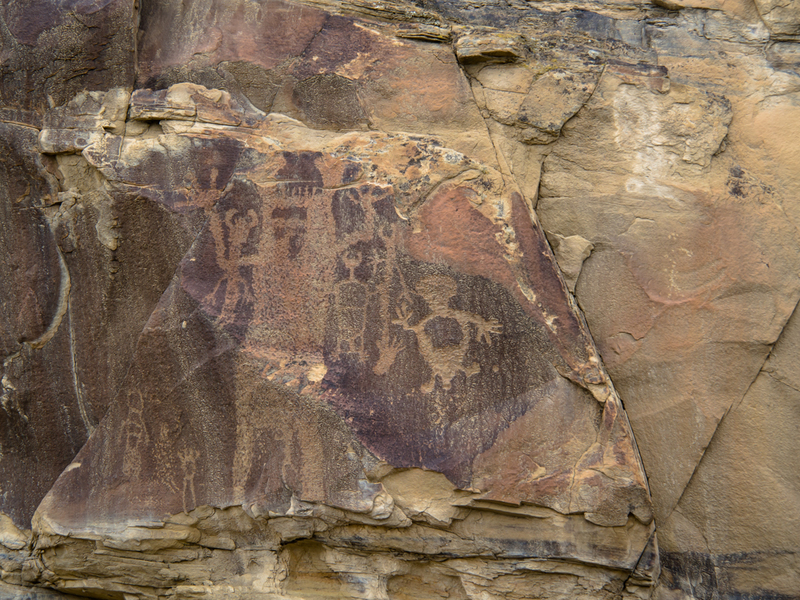 Perhaps these are shamanistic symbols. A lot of pecking was needed to form these glyphs. 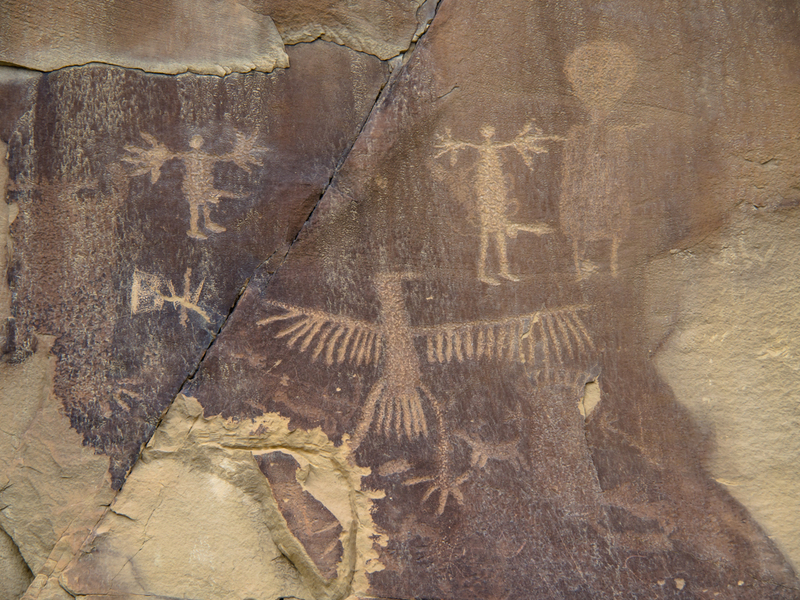 This panel had both representational and abstract glyphs. The pitchfork design is interesting. 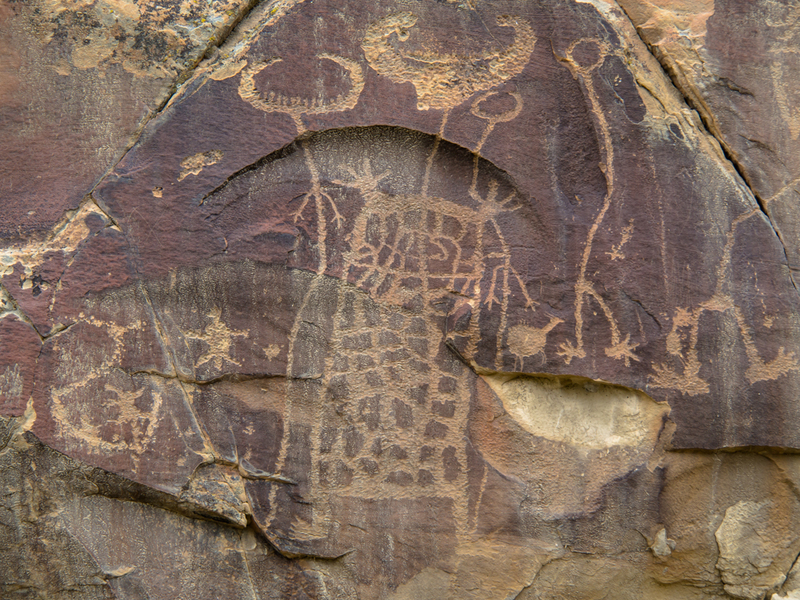 Even the remote locations are still subjected to graffiti. Note the date of 1834. Because of the age of this graffiti, it almost becomes "historic". 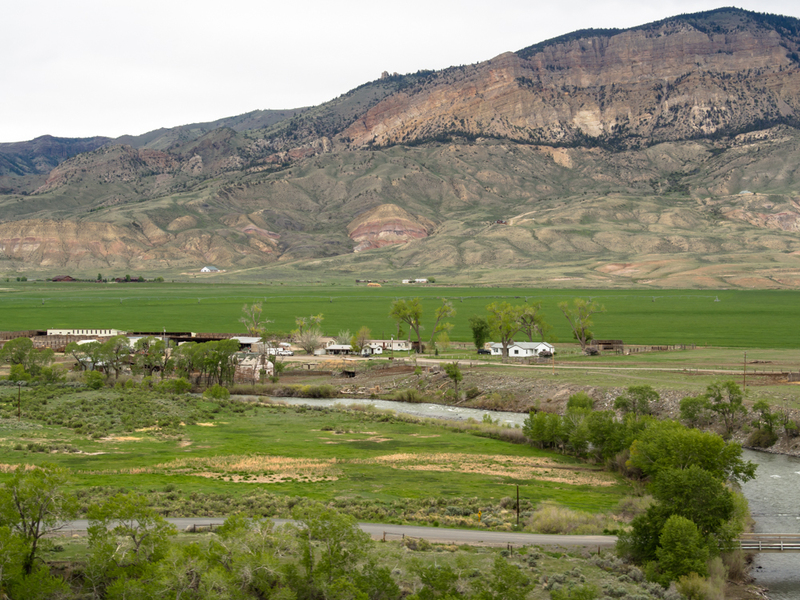 We stopped in Cody for supplies and then headed out South Fork to our friend's ranch. 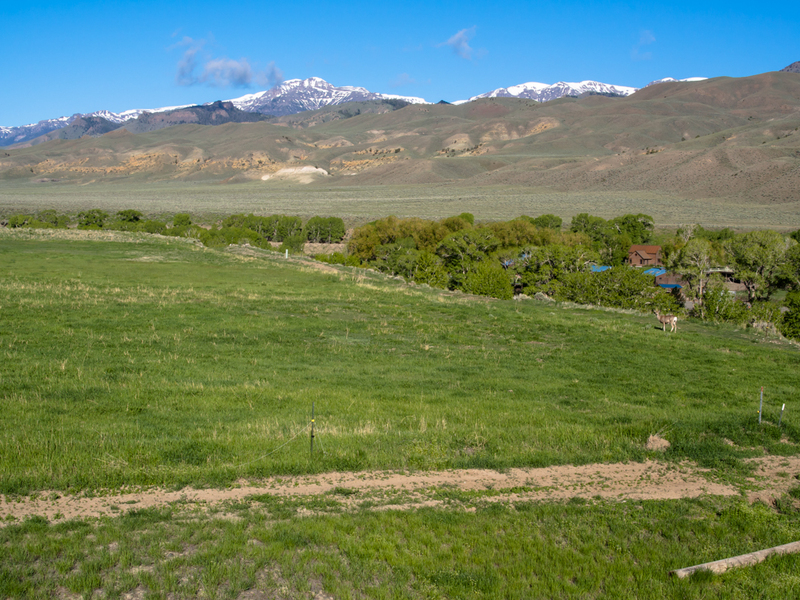 The valley is rich with good grazing land and is flanked on both sides by mountains. The front yard of the house has a commanding view of the river valley and mountains beyond. 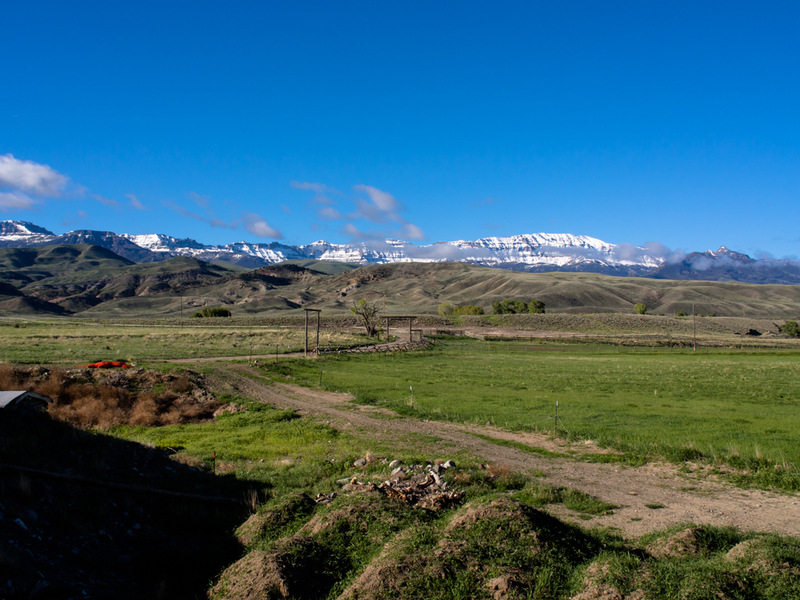 The Absaroka Range surrounds the valley. Carter Mountain had sheer cliffs. 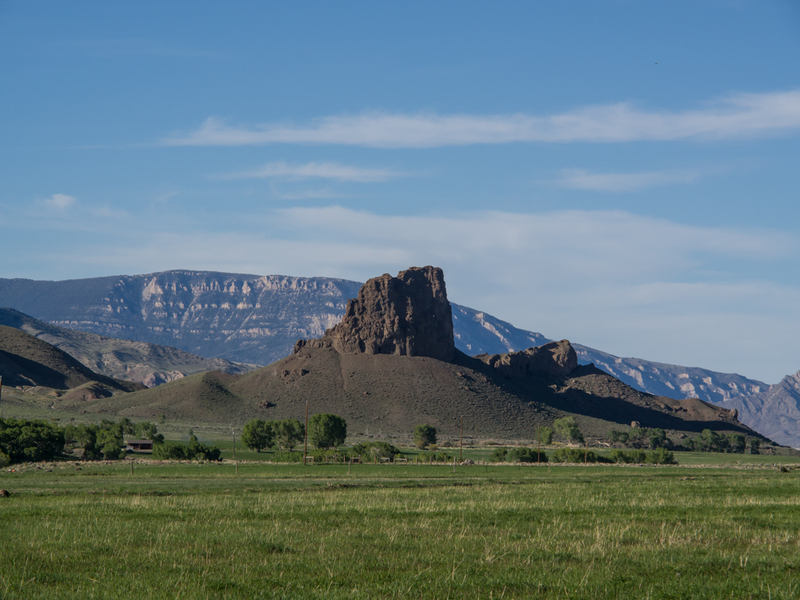 Castle Rock is a local historic landmark and is a volcanic plug. The same weather system that produced our very windy days when we were outside of Rawlins left the Cody mountains with extra snow. Thermopolis is worth stop if you are in the area. 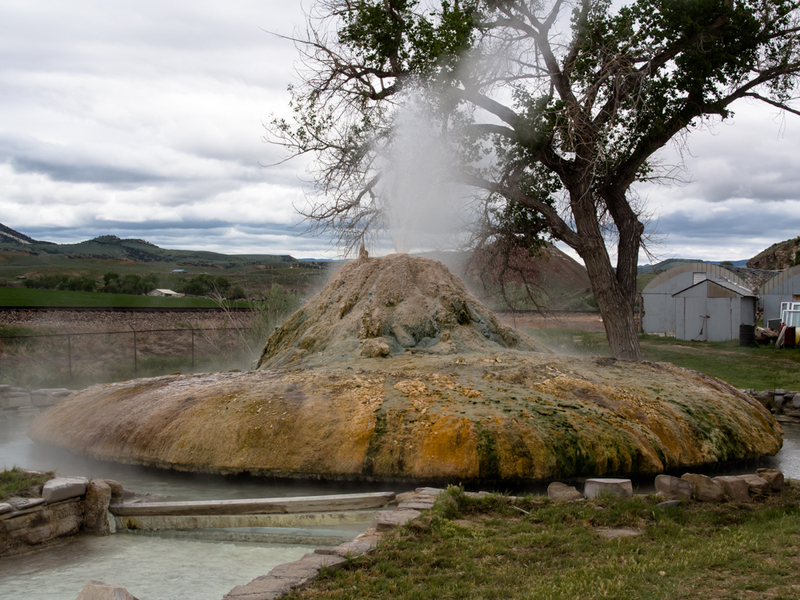 Large hot springs are always interesting from both an experiential and geological standpoint. 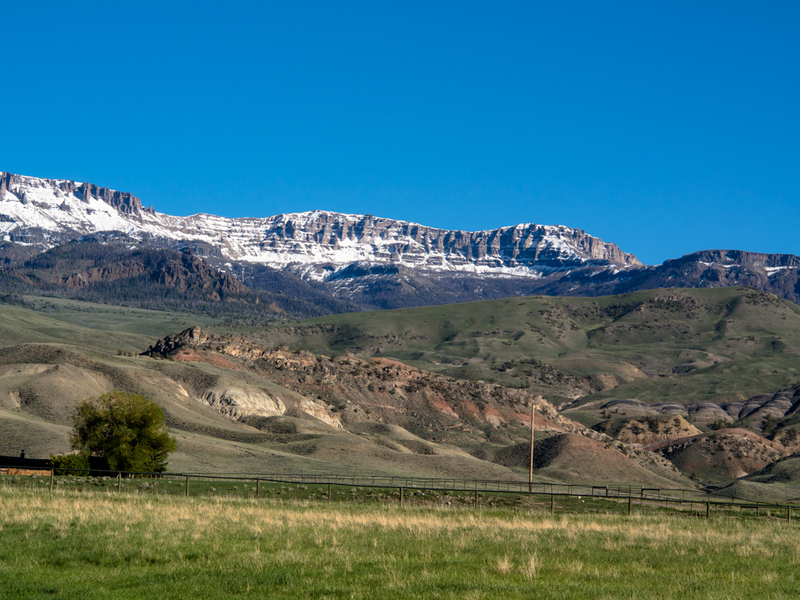 We plan to spend several days in Cody, WY doing some chores and generally catching up.